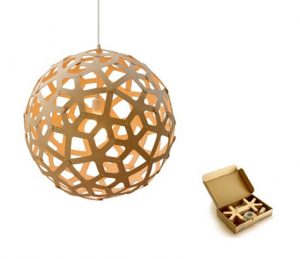 I first saw David Trubridge’s Coral Lamp at Soho’s DWR in NYC, about two years ago. From classics of the 20th century to contemporary pieces created by talented yet little known artists, the furniture and objects found in these U.S. chain stores are always very well selected, grabbing everyone’s attention for their beauty and elegance, and sometimes – like in this case – also for their innovation. The lamp was placed in a more intimate atmosphere at the back of the store, and the effect of light and shadows created by its full and empty traits was overwhelming. I was also touched by the counterpoint there seemed to be in the essence of that object: how is it possible to obtain a result as delicate and organic from the assembly of a jigsaw puzzle whose pieces are all identical, rationally designed and industrially (re)produced? A quick search on the designer has shed some light on this question: majored in naval architecture in England, lived on a boat for 5 years and then began designing furniture; his wirk uses wood from sustainable plantations and his projects seek to obtain maximum effect from minimum material; in addition, David believes in durability as a key attribute of good design and in art as a driving force of human development. Upon learning this story, I could understand that the pleasure I felt by observing this lamp had not only elapsed from the appreciation of its beautiful shapes or visual effects, but also from the perception of its soul. I believe that the soul, when present in things, talks directly with ours – and this conversation encompasses the reasons for tastes and pleasures we are capable of feeling.